Slice Celery and chop the Onion, set aside. Melt Butter in large pan. Add Onion and Celery and saute until Onion starts to become translucent. Add Sausage and Seasonings. Continue to cook until the Sausage is browned. In a large bowl, beat the Eggs. Add Dressing and stir until it is all moistened. Add the Sausage and mix thoroughly. Add 1 can of Chicken Broth, a little at a time, while mixing. 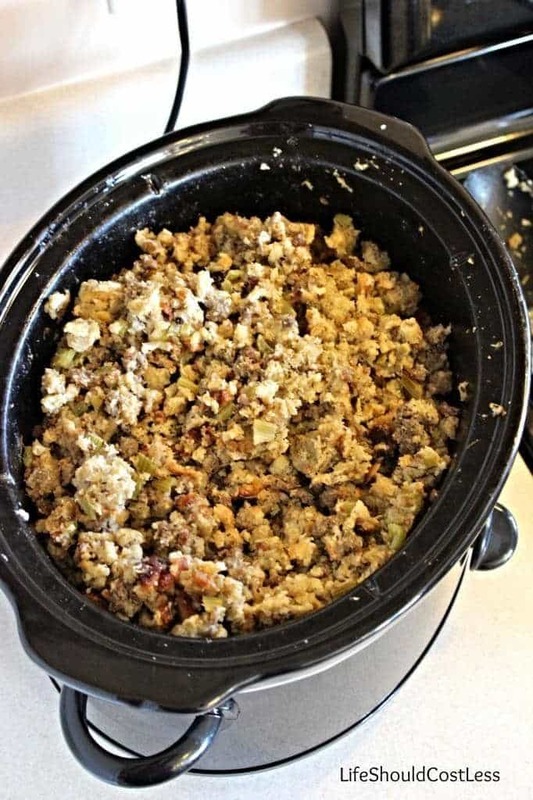 Stuff turkey and/or put in a large, greased, Crockpot on low. Cook on low for 4 hours stirring occasionally. Add the second can of Chicken Broth, just a drizzle at a time, over that 4 hours to keep the stuffing from drying out. This recipe makes enough to stuff a large turkey and pretty much fill a 6-Quart slow cooker. It can easily be cut in half. You can add extra chicken broth as needed to counter drying out.